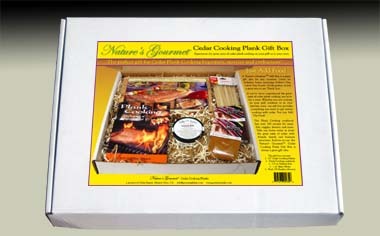 Nature's Gourmet™ Gift Boxes are great for Cedar Planks Cooking beginners, novices and enthusiasts alike. Each gift box includes Cedar Cooking Planks, the Plank Cooking cookbook, seasonings for your fish or meat and skewers for your accompanying veggies. There are recipes on the packaging or in the cookbook, all you need to do is Add The Food. There are additional recipes and tips here on the site. A Nature's Gourmet™ Gift Box makes a perfect gift for any occasion: Father's Day, Birthdays, Holidays, House Warming, Mother's Day, Anniversaries, Weddings, Graduation, Fourth of July and Labor Day parties, etc. It doesn't even have to be a special occasion. If you have never eaten fish, meat or veggies cooked on a cedar cooking plank, you're in for a treat, our gift box provides everything you need to get started cooking with cedar. you Just Add the Food. If you have, a gift box is a great way to share the experienced and Great Taste of Cedar Plank Cooking with friends, family and business associates. Don't like to grill out or it's just too cold to be grilling outdoors? No problem! Our Cooking Planks can be used in your oven with the same great results. 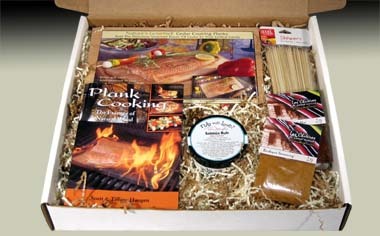 Indoors or out, a Nature's Gourmet™ Cedar Cooking Planks Gift Box is always a great gift idea. For more information on how to order, contact us sales@naturesgourmet.com. Click for More Gift Box ideas. Box has a soft foam cover over the contents and the box has locking lid for secure shipping and transport. Box is 16" x 16" x 2 3/4" and weighs approx. 5 lbs. * - In quantities larger than 50, boxes can be customized. Please contact us with your request. Note: Some items in the boxes may be slightly different. If you have a question about a specific item, please contact us. All boxes always come with genuine Nature's Gourmet™ Cedar Cooking Planks. Additional Nature's Gourmet™ Cedar Planks can be purchased online, at your local Ace Hardware, True Value, Santa Monica Seafood, some So Cal BBQ Galore and other stores. Always insist on genuine Nature's Gourmet™ Cedar Cooking Planks to get the very best taste sensation and results.